Thanks to Glyn Clough for suggesting the correct answer to this over Twitter! 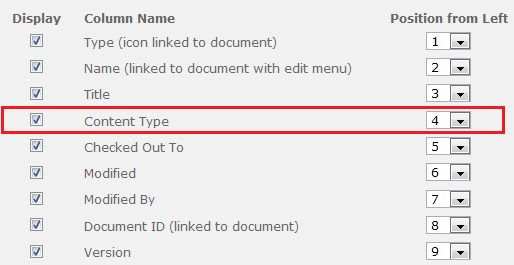 When creating a Datasheet View in SharePoint Server 2010 and choosing to display the Content Type column in the view, the Content Type does not appear in the view. In this Datasheet View Definition, the Content Type column is in position #4. The Content Type column does not display in the Datasheet View. This is especially frustrating when working with documents in bulk because you would want the ability to modify the Content Type of multiple documents at one time. 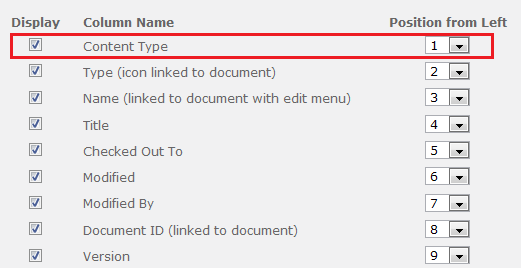 When the Content Type column doesn't display in Datasheet View, it is not possible to modify the Content Type of multiple documents at once. The solution is to modify the Datasheet View and set the Content Type column to position #1. 6. Beneath the Views heading, click on the Datasheet View, or the Standard View you would like to open in Datasheet mode. 7. Set the Content Type column to display in position #1. In this Datasheet View definition, the Content Type column is in position #1. The Content Type column does, indeed, display in the Datasheet View. Clough (2011). Glyn Clough's Blog - All About Microsoft SharePoint. Retrieved August 29, 2011 from http://www.glynblogs.com. By chance, is there an explanation of what causes this to function this way? Is this a bug? this did not work for me. content type will not show at all. How did you create a content type column? So what about Version. Not able to see Version field. @Dani - You don't have to add a Content Type column in order to display Content Type in a View. Content Type is available by default to use in Views. @Aparna G - In my environment, the screen print was cut off but Version does display. Are you having an issue displaying Version in your environment? @JasonO - Good question; I can post a support case to Microsoft and ask them for their official explanation for this.